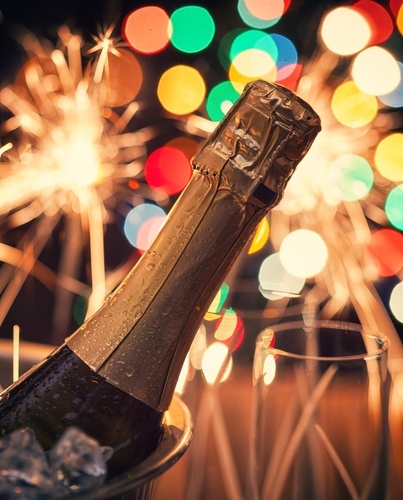 If you bought a home in 2018, it’s time to celebrate! Why not throw a New Year’s Eve party to both welcome in the New Year and show-off your house to your friends and family? You don’t need tons of money or time to prepare in order to host an unforgettable celebration. Here are some quick tips to get your house ready for a champagne toast at midnight on January 1st! It’s tempting to invite every single one of your Facebook friends to your party. But keeping your list manageable is the key to a stress-free event. Limit your invitations to close friends and family. You’ll spend less money and have more time to enjoy with each of your guests. One of the most expensive aspects of hosting is keeping a well-stocked bar. Instead, ask your guests to bring a bottle of their favorite libation. Most people are eager to help, and this gives them a concrete way to chip in. Plus – you’ll know that they’ll have something to drink that they enjoy. Your guests will inevitably ask you what they can do to help when they arrive to the party. Helping out a little makes people feel at ease and welcome. Make it easier on yourself by creating a list of tasks that guests can do for you when they arrive. Then when they ask, simply assign them a job from your list. A huge part of the fun of hosting at home is creating the perfect ambiance. New Year’s Eve parties are a great time for the twinkle of string lights and votive candles. The soft glow makes everything (and everyone) look that much more beautiful. Set up party zones so that people can help themselves. Have a separate drink station and food station. Clear the main gathering room of clutter so your guests can get comfortable. Make sure to take everyone’s coats when they arrive and either hang them in your foyer closet or keep them on your bed. Parties are more fun with games – even if everyone attending is an adult. Here’s a fun game from Real Simple – print out cards that require guests to fill-in their wishes for 2019 and have everyone guess who wrote what. Check out more party game ideas here. No party is complete without the perfect playlist. Create a festive atmosphere with an expertly curated selection of songs to play throughout the night. You can search for New Year’s Eve playlists on Spotify or browse stations on Pandora that will set the right mood. If you can’t find what you’re looking for, create your own. Here’s a great list of New Year’s Eve songs to get you started. Finally, make sure your guests have all the confetti and noisemakers they will need when the ball drops and the clock strikes midnight. You can stock up on favors at your local dollar store without spending too much money.